Heat the olive oil in a large skillet over medium heat. When it is hot, stir in the ground meat. Once your meat is browned (no longer pink), add the onions, green pepper, garlic and the can of diced tomatoes. Stir well and allow it to cook a few more minutes. Once the mixture is simmering by lowering the flame, add the tomato sauce, wine and seasonings. As you wait for the combination to return to a simmer, chop up the pimiento stuffed olives and add it to the pot. Add the raisins and adjust the seasonings. Add water to bring the picadillo to your desired consistency. 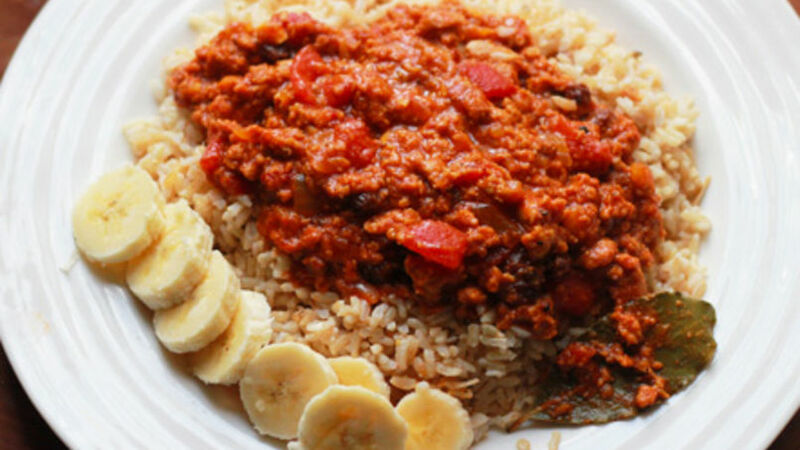 For a really traditional Cuban meal, serve the picadillo over fluffy white rice, with a side of fried or sweet plantains. Cooking Picadillo is a tradition in most Cuban households. At home we eat Picadillo at least once a week! It is a delicious ground beef hash, filled with the smoky flavors of cinnamon and cumin, and served over a bed of rice. Every single cook in my family has his or her own version of Picadillo. They may have some basic differences, but what they do share in common is that they all taste wonderful. With a wealth of tomato and garlic, Cuban Picadillo is a traditional recipe that stands the test of time.